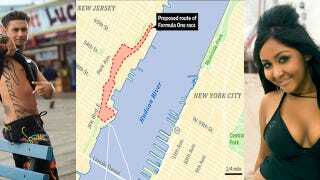 The Wall Street Journal reports this morning that despite talks stalling last year, Formula One may still be headed to New Jersey for an event in the shadow of the Manhattan skyline. The mayors of Weehawken and West New York, N.J., said Tuesday that they are in early stages of talks with a group of investors led by Leo Hindery Jr., a former chief executive of the YES Network, to bring an F1 event to the area as soon as 2013. Key to the project is that it is self-sustainable and not in any way reliant on tax dollars. If approved, the proposed race would be a second U.S. event for F1, which has announced an annual race in Austin, Texas, starting next year. The proposed layout would be a street circuit on the New Jersey side of the Hudson River with the New York skyline as a backdrop. The Journal included a look at the proposed circuit which we've included above, framed by what will likely be the official ambassadors for the new race.